North Korea's latest missile test happened after the recent military parade. The United Nations Security Council on Thursday condemned North Korea’s latest missile test and demanded Pyongyang not conduct any more nuclear tests in a statement that was delayed as the United States and Russia sparred over its language. A North Korean missile blew up almost immediately on its test launch on Sunday, the U.S. military said. The 15-member Security Council traditionally condemns all launches by Pyongyang. Such statements are agreed by consensus. It is rare for council members to wrangle over standard language and the dispute came amid U.S. and Russian tensions over Moscow’s support for President Bashar al-Assad in Syria’s civil war. Previous statements “welcomed efforts by council members, as well as other states, to facilitate a peaceful and comprehensive solution through dialogue”. The latest U.S.-drafted statement dropped “through dialogue” and Russia requested it be included. “When we requested to restore the agreed language that was of political importance and expressed commitment to continue to work on the draft … the U.S. delegation without providing any explanations canceled the work on the draft,” the Russian U.N. mission said in a statement on Wednesday. The United States told council members it cut the words because they “would overly narrow the means by which the international community could arrive at a peaceful and comprehensive solution to the North Korean nuclear problem,” according to diplomats. Diplomats said Pyongyang ally China had agreed to the statement. The condemnation eventually agreed by the council included the words “through dialogue” and said the council was prepared to consider further sanctions. 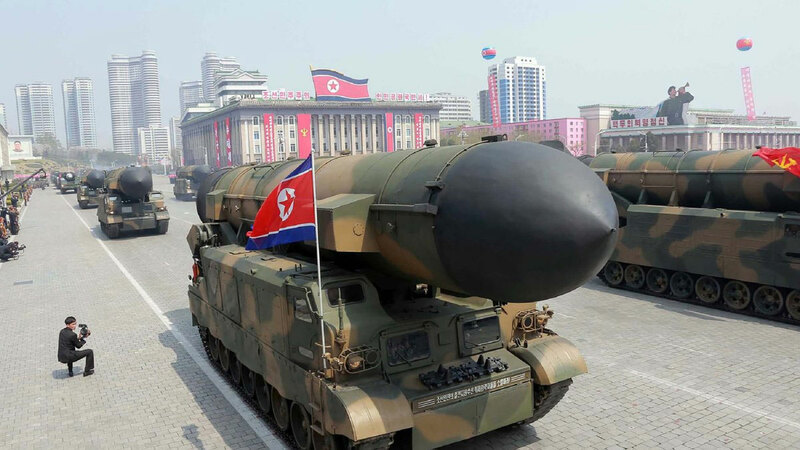 North Korea has been under U.N. sanctions aimed at impeding the development of its nuclear and missile programs since 2006. The 15-member council has strengthened sanctions following each of North Korea’s five nuclear tests. Tensions have risen after U.S. President Donald Trump took a hard rhetorical line with North Korean leader Kim Jong Un, who has rebuffed admonitions from China and proceeded with nuclear and missile programs seen by Washington as a direct threat. The Trump administration is focusing its North Korea strategy on tougher sanctions, possibly including an oil embargo, a global ban on its airline, intercepting cargo ships and punishing Chinese banks doing business with Pyongyang, Reuters reported last week, citing U.S. officials. U.S. Secretary of State Rex Tillerson will chair a United Nations Security Council meeting on North Korea on April 28 to discuss how the body can combat Pyongyang’s banned nuclear and missile programs. U.N. condemns North Korea missile launch. Russia, U.S. spar over words. The North Korean missile blew up almost immediately on its test launch on Sunday.